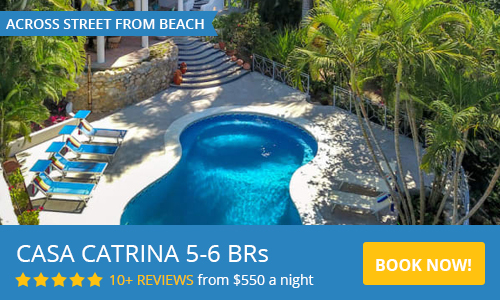 Casa Sonadora in Sayulita is a truly exceptional 3 Bedroom (plus convertible TV room/bedroom and a small room for 2 children) 3-1/2 bath vacation rental home with every imaginable amenity and some amazing features found nowhere else in Sayulita. It is a brand new home in Sayulita's most sought after location, directly above the premier surf and swim beach and steps to town center. Need more room? We have three other homes next door that can also be rented to accommodate large groups. Together, these four exquisite homes make up Dreamer Circle Properties, Sayulita's best option for your large group in a great location. Casa Sonadora is one large house that has 3 bedrooms and a convertible TV/Bedroom with a custom queen couch bed plus a couple of child single foldout beds stored in the closet. In addition, there is a bunk room that adjoins the lower king room and has 2 single mattresses. There are 3-1/2 bathrooms, 2 outdoor showers, 2 Roman bathtubs and even a treehouse! The first floor of Casa Sonadora also has wonderful ocean views which can be enjoyed from the kitchen, dining room, living room and additional master suite. Off the dining room, there is an outdoor palapa sitting area with pool, garden and ocean view. The living room enjoys the same view with the pool just outside the sliding glass doors. The master suite downstairs is similar to the upstairs one without the outdoor shower, but with the addition of a large LCD TV and surround sound system. There is a small room adjacent to the downstairs master bedroom, 8 feet by 8 feet, wiith a bunk bed for two chldren. This is a great situation for a couple with one or two children since the children can stay near their parents. This room is ideal for 3-to-11-year-olds. The entire house is beautifully designed and artistically appointed with antique Mexican art and traditional Mexican artifacts. Every bedroom has its own unique charm. They all are air-conditioned, have pillow top mattresses and luxury linens. The whole house has filtered drinking water and there is a pressurized water system too. The swimming pool is heated (great between December and April) and no chlorine or chemicals are used – it is ozone-treated with a touch of salt. There are lawns and beautifully landscaped private tropical gardens. There are DVD players, stereo systems (Ipod compatible) and 50" satellite flat screen TVs. WiFi has also been installed. There is an outdoor shower by the pool and a treehouse with hammock where you can luxuriate in style with exceptional ocean views. Every detail has been thoughtfully considered to add to the comfort, beauty and serenity of your stay. Regular maid, gardening and pool service is provided and our property manager, can make arrangements for a cook if desired. 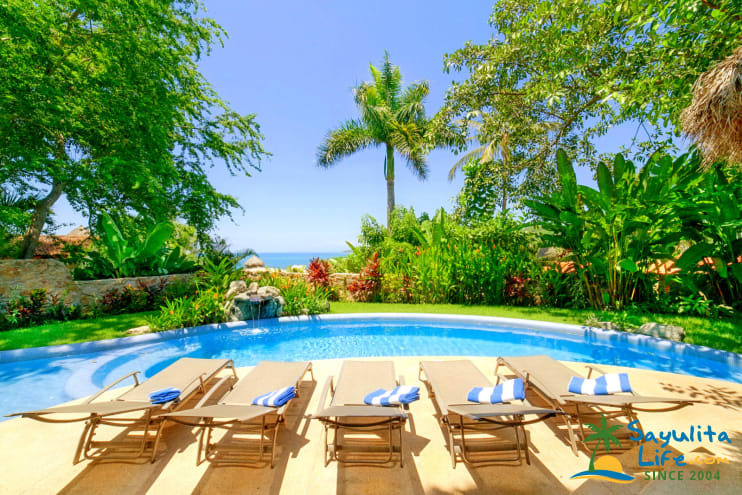 If you book Casa Sonadora, you will be contacted with information (from airport travel from Puerto Vallarta to Casa Sonadora, to the best places to change your money, eat, etc.) Once you arrive Eric can recommend the best restaurants, masseuses and activities in the area. The peacefulness and beauty of this property cannot be conveyed in words or pictures. You are away from the town’s bustle and directly above the surf break. You can listen to and watch the surf, the surfers, migrating whales and swooping birds while enjoying a cooling breeze. Just a short 2 minute walk down the meandering garden pathway and you are on the beach or a block from the Sayulita town square. Casa Sonadora is literally your Sayulita tropical dream vacation come true. To view our three homes next door, please visit Dreamer Circle Properties, Sayulita's best option for your large group in a great location. We really enjoyed the house...great kitchen and pool! We really enjoyed the exceptionally beautiful house and people we met in Sayulita where we spent three weeks to celebrate my dad’s 60 years birthday. The convenient location with a two-minute beautiful meandering jungle pathway to the center and the beach of the pueblo magico of fit our party almost perfectly. Two surf-enthusiasts had semi-great luck with 14 days of epic surf that they could always check from the upstairs Palapa, the water-runners could enjoy the enough-deep pool and the toddler was happy with the smaller and larger sides of the pool. Everybody loved the village and the convenient location. The mexican art pieces finalized the beautiful design and the upstairs Palapa and downstairs patio were lovely to hang out in. If we come back, we will definitely book the same property again. Even the ones who don’t move so easily were able to manage the hill-top location eventhough it was slightly tricky with the child trollies. The home is so beautifully decorated - the owner’s have an amazing aesthetic. The home and pool are beautiful. The locals were so warm and welcoming - they make you feel so welcome. Please note: the town isn’t a “sleepy fishing village” at night as music permeates up the hill into the house - even though the house has high-end double pane windows. Granted I am a light sleeper - but the obnoxious music was the only negative to an otherwise truly amazing visit. We loved Casa Sonadora! Gorgeous views, really clean and well-run property, best location with a short walk down a hill to the beach, lovely staff...would definitely come back and recommend! Perfect beach vacation home for 2 families with kids! Casa Sonadora was a true vacation--with the views, weather, and food to match. Ernesto arranged for an excellent cook, the house was always clean and tidy, and we were thrilled to have both the lovely view and the quick beach access. We hope to return soon! The Casa Sonadora is a wonderful villa, great views, amenities and large enough to accommodate several families. Close to the beach and the town, but isolated enough to provide privacy. Highly recommend the property! Our stay at this casa was wonderful! We were a family of 11, ranging in age from 10 months to 71 & we stayed for 10 days. The house is beautiful & user friendly. It has everything you could possibly need. Staff is very accommodating. We surfed everyday and walked to beach every day. It is a short beautiful walk. We found the town delightful & food was great! Plan on returning next year! We had a great time! Being a short walk from town and the beach was so convenient. We rented a golf cart which was nice as the path is a little steep if you have a lot of items. The house has two master need rooms, one upstairs and one downstairs, in addition to two other bed rooms. We had nine people and we easily fit. The views from the pool deck and patios are completely breathtaking. Our three teenagers and they loved the pool and treehouse. One of the trees just outside the backyard has many iguanas throughout the day. It is so entertaining to watch them! If you are looking for other things to do we did a few other day trips. We went to the great outdoors zip line tour (action packed day) and snorkeling at the marieta islands. We loved the property and this rental. The house is beautifully appointed and the decor is colorful, tasteful and just lovely.